Ads are current to the best of our knowledge. please Contact Us with the information. Notice: All prices indicated below are subject to change. ALWAYS check with the person or vendor for the latest information on pricing, shipping and availability. For sale- If anyone is interested in restoring a beauty, please get in touch with Sam Hollingsworth, 2090 Sugar Hill Road, Monroeville, AL 36460 1-251-765-9053 bigsambootsie@hotmail.com. Thanks (01-2018). www.studebakervendors.com is the place where customers and vendors meet. Forget the phone, the mail and the SASE. 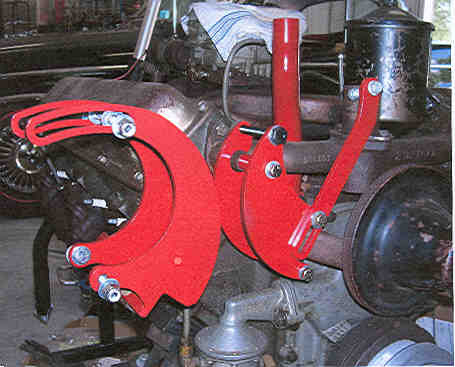 All the major vendors are listed on Studebaker Vendors. Just point, click, and view. Most vendors have Email, and many have on-line shopping carts. www.Studebaker Vendors, is your one stop shopping mall. For sale: I have a T-85OD transmission plus most, if not all, the bits and pieces cannibalized from a rusty 56J, with hopes of converting my 56J to stick shift. The steering column is missing, but I have the clutch linkages and pedals, shift rods, and lots of other stuff. At my age I know I’ll never get around to the conversion. I’m open to offers for local pickup in the Atlanta area, or possible delivery to Mansfield in September. Email me at chuck@lampman.com. 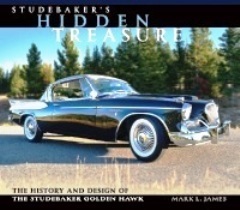 Studebaker's Hidden Treasure: The History and Design of the Studebaker Golden Hawk, by Mark L James. In this brand new book you'll read about one of the most iconic American performance pioneers of all time- the legendary Studebaker Golden Hawk. We are accepting pre-orders for this limited print run. The book is at the printers and will ship as soon as it arrives in our facility. Adhesive Vinyl Inserts, for all 1956-1961 Studebakers with full wheel cover (AC 2799). Enough vinyl inserts to apply to 4 hubcaps, with spare inserts. Directions are included $27.50, includes shipping in the continental U.S.
New, reproduction Fuel Tank Sending Units, ignition coils, and more are available from KM Lifestyle Manufacturing Company, 12 Jacques Street Worcester, MA, 01603.